Ya Jagoff!!! 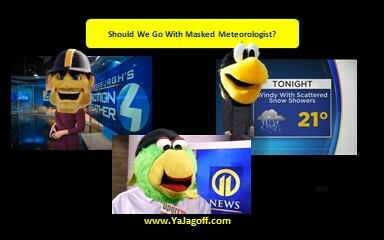 | The Masked Meteorologists? Home Uncategorized The Masked Meteorologists? Last week, our friend Sean from the Sean’s Ramblings blog, wrote a guest blog about which Pittsburghers you might want to see singing in Pittsburgh mascot costumes. This past weekend, local meteorologists took it on the chin, a bit, for a few incorrect predictions regarding snow fall amounts, timing, etc, etc. They took on some scud-missile-like tweets and Facebook comments. None of them quite as ugly as what a European professional soccer goalie who blows a championship game by letting the game-winning goal in after a triple overtime gets but… kind of close. Look….I have no idea how to predict the weather. I don’t even know why they think they have to pinpoint a temperature for a day. Why say it’s going to be 32, or 47 degrees? Just say it’s gonna be “about 30 or so” or “just under 50.” That’s all the info I need for the day. But they try so hard to be detailed… even giving us the European model thoughts now. So… my solution…. the next time there is a big weather event, instead of the meteorology peeps rolling up their sleeves in the severe weather center or sleeping overnight at the station in a super hero sleeping bag… put on a mask and give us that forecast! Not one of us would tweet something bad to Iceburgh or post a nasty Facebook comment to Steely or the Parrot! Ok.. maybe SOME of you have posted nasty stuff to Steely! To all of our meteorology friends, we always say that the word Jagoff has more than one definition. Today…we use it as a term of endearment when we say… none of us would want you all coming to OUR jobs and judging us soooooooo…..keep doin’ wha ya do… Ya Jagoffs!!! Previous articleWhat’s Worse than a CVS Receipt?